UPDATE FEB., 2017 - The Pima Pedestrian Path was built in the late Fall of 2016. In January, 2017, after winter rains, it was determined the water harvesting basins were collecting too much street water and not draining quickly enough, so the City of Tucson is working on modifying the basins. This may take some time. Any plants that die from sitting in standing water for too long will be replaced in the Spring of 2017. A landscaping contractor will maintain the medians and plants until 2019. Then Garden District Neighborhood will be responsible for maintenance. The Spring of 2017, the Pima Pedestrian Path was completed. It was a long, long process to bring the path to reality. 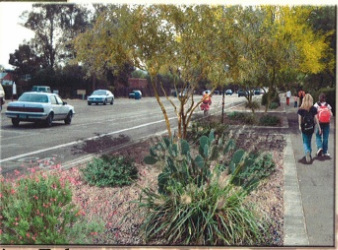 In 2007, the Garden District Neighborhood Association received a ProNeighborhoods Planning and Design Service Award for the pro bono services of a professional team to design a linear park on the northside of Pima between Columbus and Alvernon. The professional team, composed of four engineers, a landscaper, a hydrologist, and a planner, worked with neighborhood residents to develop a design for a pedestrian path. In 2008, GDNA then applied for and received a Traffic Enhancement Grant from the State of Arizona for constructing the Pima Pedestrian Path. Pima, a collector street, is paralleled by a half mile access road between Columbus and Alvernon. This contiguous access road is a major pedestrian route to numerous amenities and businesses in this densely populated area. There are no sidewalks, no physical barriers -- nothing to protect pedestrians from 35 mph traffic. The Pima Pedestrian Pathway (PPP) will improve the safety and connectivity of this busy pedestrian route and regional bicycle corridor. It will create curbed medians, enhanced ADA bus shelters, and protected pedestrian pathways behind landscaped barriers. The PPP has two variations depending on the (1) placement of buildings relative to Pima, (2) the vehicle access needs of residents, and (3) emergency and service vehicle needs. * Offer safer routes for children attending neighboring schools, e.g. Wright Elementary, St. Cyril’s, Doolen, and Catalina High. * Enhance the aesthetic appearance of a major commuting route. * Create an attractive landscaped buffer to help shelter residents from noise, traffic, casual crime, and trash. * Provide safer bike lanes since traffic can no longer cut across painted bike lanes to access homes or pass illegally.